In electromagnetics and communications engineering, the term waveguide may refer to any linear structure that guides electromagnetic waves. However, the original and most common meaning is a hollow metal pipe used for this purpose. A dielectric waveguide employs a solid dielectric rod rather than a hollow pipe. An optical fibre is a dielectric guide designed to work at optical frequencies. Transmission lines such as microstrip, coplanar waveguide, stripline or coax may also be considered to be waveguides. The electromagnetic waves in (metal-pipe) waveguide may be imagined as travelling down the guide in a zig-zag path, being repeatedly reflected between opposite walls of the guide. For the particular case of rectangular waveguide, it is possible to base an exact analysis on this view. Propagation in dielectric waveguide, may be viewed in the same way, with the waves confined to the dielectric by total internal reflection at its surface. 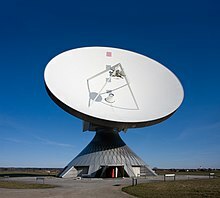 ...that Intelsat 1, known as Early Bird, launched in 1965, provided either 240 voice circuits or one two-way television channel between the United States and Europe. ...that in 1880 France rewarded Bell the Volta Prize, worth 50,000 francs, for his invention.